I tried experimenting with making my own sweet popcorn after purchasing Chocorn a few weeks ago. Chocorn is the winning product of the first season of Recipe to Riches. I was so disappointed at the tiny amount of popcorn the packet included (and what they were charging for it!). You can make your own and get a larger quantity for a fraction of the price. Use this recipe as your base and then coat with a melted chocolate of your choice, or enjoy as is! Pop the kernels using your preferred method. I like putting them in a brown paper bag (roll the tops to seal) and put it in the microwave for three minutes. You will need to do split kernels into two batches if you use this method. Once popped, spread the popcorn out on a big tray covered in baking paper. Sprinkle the salt over the popcorn. Pour caramel over popcorn. Quickly distribute the caramel by tossing the popcorn with two big spoons, coating the popcorn. Don't worry if you can't get all of it, the caramel will melt in the oven. Bake the caramel popcorn for about five minutes (you want it to start melting), then remove from the oven and toss the popcorn again with the two spoons. Return it to the oven and bake it for another five minutes, toss again. If the caramel still hasn't fully melted and coated the popcorn, return to the oven for about five minutes (be careful to watch it doesn't burn). Bonus: Salted Choc Caramel Popcorn: Double boil two cups of chocolate chips until melted. 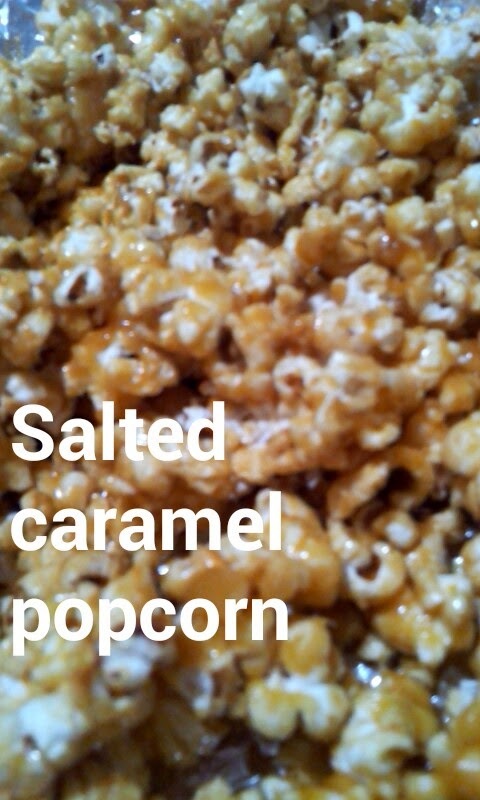 Coat caramel popcorn with melted chocolate and allow to cool. Yum! This looks amazing, can't wait to give it a try! I'm definitely going to try this out one day as I love popcorn and have a bit of an obsession with salted caramel at the moment! !